History of Sabatona Super Speedway: 25 Years and Counting! The track was built in 1985 by a racer in the Cleveland OH area named Terry "TycoTerry" Tustan. Terry raced as a kid at the Parma raceway HO track. 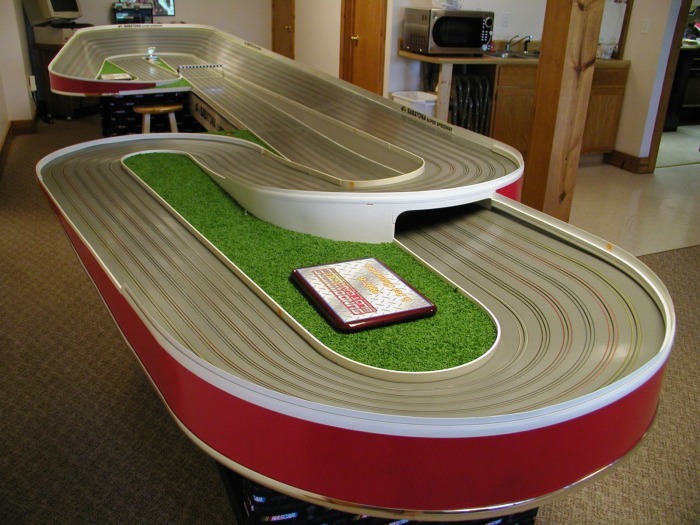 Terry wanted the track, but at the time it was not for sale, so being a woodcrafter, he decided to "copy" the original Parma track, but with a few special modifications of his own. Terry added a 4' straight section between the ends of the track, and steepened the main bank from 30 to 55 degrees. Originally, the track was a copper tape track, and they raced Riggins and Tyco pan cars.Terry would also use copper tape as they were then racing Tyco pan cars and Riggens cars, no need for steel rails. The original name of the track was the "Cleveland International Raceway", or CIR. 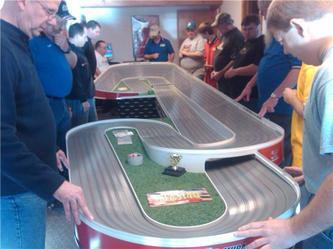 Sometime after the build of this track, Terry aquired the original Parma Raceway Engleman, and he also built a smoked lexan magnet car track. With CIR gathering dust and doubling as a table (like most tracks do), Terry decided to sell CIR, so he listed it on E-Bay. I was surfing e-bay looking for some old HO cars from my childhood, when I stumbled on the listing. 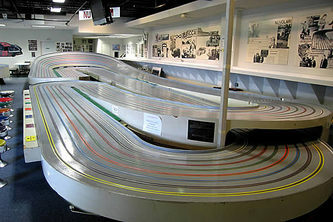 The track looked exactly like the original Elmsford Raceway "Nuvolari" track (See below) that I had raced on from the age of 5 to about the age of 20. 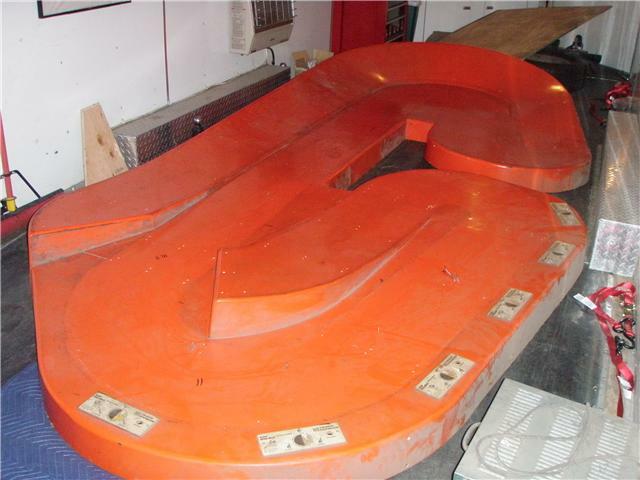 To make a long story short, I won Terry's auction, and picked up the track in June of 2005. I started rebuilding/reworking the track in August of 2005, adding additional rail pocket slots for wire magnet car rail (another whole story), and completed the rework/restoration of the track in February, 2006. The name of the track then changed to "Sabatona" in tribute to both my fondness of Daytona, as well as my sir name. The track is now celibrating its 25th year. The rebuild took about 200 hours from start to finish. Please see the 1985 Build, 2005 Rebuild, and 2006-2010 Sabatona sections for photos of the build and more information. The History of 5 Tracks, and how they are all related.......I think??? What do these 5 tracks all have in common? They are all the same basic layout, an "Engleman Folded C", but how they all came to be is quite interesting......In a way, they are all related, the strange thing is that most of the builders did not know the other tracks existed! Track 1: The photo on the top left is of the ORIGINAL Parma Raceway HO track, now currently owned by Terry Tustan. This track was built by a local cabinet maker in the Cleveland area, and is what is known to be a 1 of track. 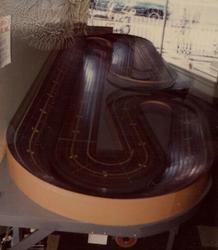 Track 3: The track on the top right photo is the original 1985 "CIR" track, built by Terry Tustin. Terry raced as a young adult on the Parma HO Track (Track 1), and wanted to have his own version of the track. Terry increased the length of the track, and increased the bank turn from 30 degrees to 55 degrees as his modified Tyco's would launch on the Parma Track. 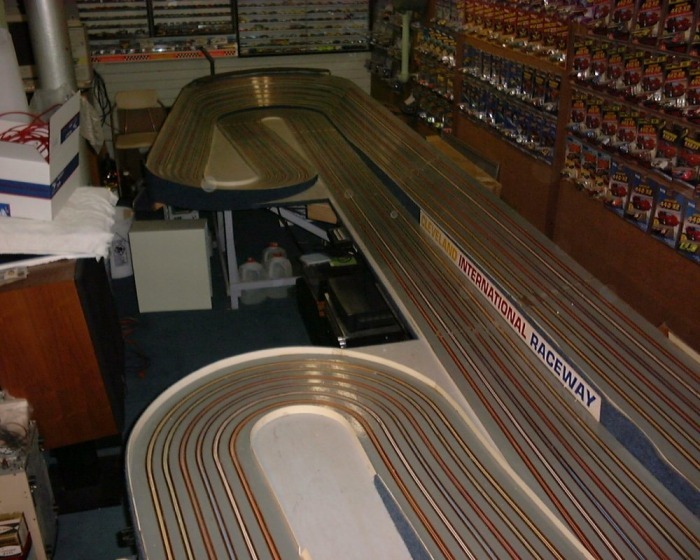 Terry sold this track in 2005 to Len, and the track was reworked and is now the "Sabatona Super Speedway". Terry now owns the original Parma Track, Track 1. 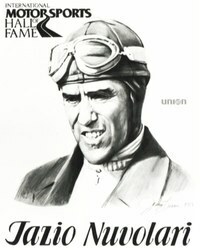 Len purchased the CIR (Track 3) from Terry as it was the spitting image of Len's favorite track from his youth, the Nuvolari at Elmsford Raceway (Track 4). Terry had no knowledge of the Nuvolari as it was a 1/24th track in NY, but the mods he made to the increased straights and 55 degree bank turned the Parma layout into a near duplicate of the Nuvolari, Track 4. So, to get this straight: Track 1 is owned by builder of track 3. Track 2 is a copy of track 1, and is owned by the owner of track 5. Track 3 was bought from the owner of track 1 as it was the spitting image of the buyers favorite track, Track 4, which the builder (Terry) had never seen....Track 4 was copied by the owner of Track 5, who is now also the owner of Track 2, a copy of Track 1. Its just that simple! If you have any questions on this, please ask someone else, as I have confused myself! All I know is that I really liked Track 4 (Nuvolari) and I bought Track 3 (CIR, Now Sabatona).